Missing proper burgers? These (utterly delicious!) 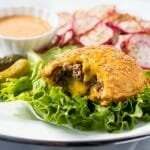 gluten free and keto cheeseburger pockets are guaranteed to fill the bill. These gluten free & keto cheeseburger pockets come highly recommended. Think a delicious (and sturdy!) keto bread dough, wrapping up a classic cheeseburger filling. Fact is, it’s a fair bet that whoever tries these guys cannot believe they’re actually low carb. You might (or not!) be surprised to hear that we use our grain-free tortilla dough here…! You can get three 5-inch keto cheeseburger pockets out of a batch of dough. 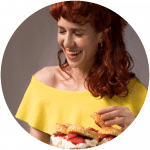 But keep in mind that you don’t need to make it all into these pockets, as you can make actual keto tortillas, puffed up tortilla chips, brie cups… i.e. you’ve got options. We like a mixture of super fine almond flour and coconut flour best. Add a touch of xanthan gum, baking powder, and we’re golden. 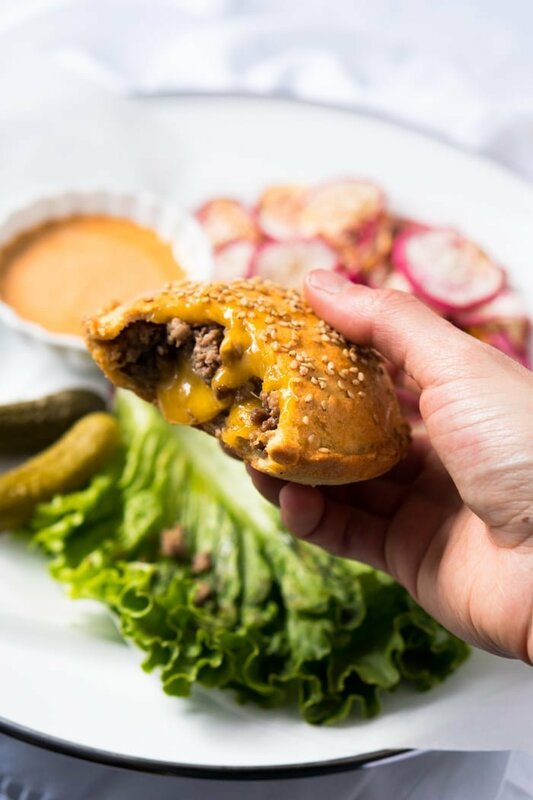 We love to fill up these keto cheeseburger pockets with generous helpings of ground beef (cooked with a touch of lightly sautéed onions and garlic), a few slices of pickles, and a generous helping of sharp cheddar cheese. Simple does it here. But you could also fill it up with actual burger patties, the choice is yours. 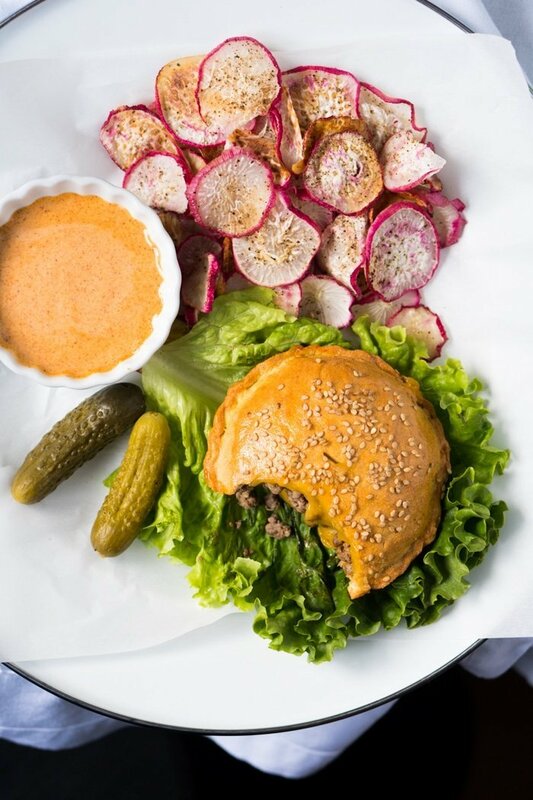 Oh, and not filling per se, but our keto cheeseburger sauce comes highly recommended. As does serving it up with a side of keto ‘potatoes’ (i.e. roasted radishes!). These gluten free & keto cheeseburger pockets come highly recommended. Think a delicious (and sturdy!) keto bread dough wrapping up a classic cheeseburger filling. Wrap dough in cling film and knead it through the plastic for a minute or two. Think of it a bit like a stress ball. Allow dough to rest for 10 minutes (and up to 5 days in the fridge). Preheat oven to 350°F/180°C. Line a baking tray with parchment paper. Break the dough into six 1 1/4” balls (30g a piece). Roll out between two sheets of parchment paper with a rolling pin or using a tortilla press until 5-inches in diameter. If fuzzy about presentation, trim edges. Use the dough ASAP, so it remains sticky and you can close the pockets easily (it dries out after 10-15 minutes at room temp and you would have to re-roll it). Assemble cheeseburger pockets by adding a layer of cheese, followed by ground beef, pickles and more cheese. Press 3/4 of the edges together and fill up with more ground beef (we like them nice and plump). Fold or press edges down with a fork. Place cheeseburger pockets in prepared tray, brush with egg wash, sprinkle with sesame seeds (optional) and bake for 20-25 minutes, until golden all over. These guys are best served warm and straight from the oven, but they also do re-warm quite well. Please note that nutrition facts below are estimated for the dough only. 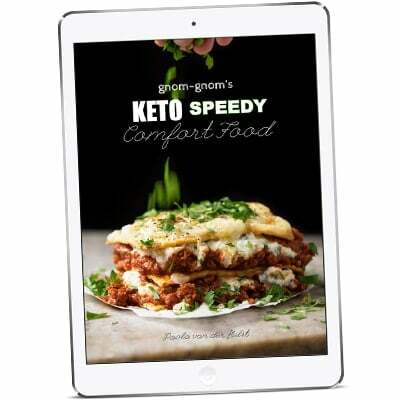 Having said that, net carbs should still be close to 5g net per keto cheeseburger pocket if using ground beef and block cheese. Hi I really want to try this recipe but I am allergic to almond 🙁 is there any other flour you can recommend me to use instead of almond to replace? Is this 3 servings or 6??? I really want to try this and have all the Ingredients but no food processor or kitchenaide. Can I use a hand mixer? Thanks. Love your recipes!!! Yes!! Just watch out for ‘flying bits’ as the dough is quite stiff, might need to knead it a but longer by hand xo! Bacon cheeseburger hot pockets!?!? What’s not to love? Yeah, I added crumbled bacon to them. You know I gotta add something to almost everything 😊 These are awesome! Perfect for lunch. Hello, Just found you today! 1 week into Keto. These read incredible but I have a tree nut allergy and can’t use almond flour – do you think these would work ok with all coconut flour and double the egg (2) and double the water? Hi Toni! A good almond flour sub is sunflower seed flour (I haven’t trie dit myself here though) xo and welcome to gnom-gnom! I’d like to make these. They look amazing. Question, I buy my ground beef by weight. So, should I purchase 12 oz of beef for the three pockets? Just want to confirm. Thanks!!! I do not have coconut flour can i just used almond flour and if so how will the measurements change of the almond flour in order to accommodate? Unfortunately subs don’t work well here xo! I see a slit at the top of your finished product. Do I need to make a small cut at the top befoer putting into the oven? Thanks! I’ve only tried unbaked and yes it works awesome, them you can bake straight from the freezer xo! Anyway I could bake these and use them as buns to top/bottom a burger. I LOVE a grilled burger and since its summer want to take advantage! Definitely making your dipping sauce, yummm!! Hello! I have a question. I don’t own a food processor. I have a Kitchenaide Mixer with a wire whip–would that also work? Definitely Shela! Just use the paddle attachment xo! Do you have to use the xantham gum in this recipe, because I don’t have any, or can you substitute something else in the place of it? This recipe looks really good and simple. Thanks for sharing. Hi Debi! Unfortunately you do need the xanthan gum here as it’s what binds the dough together xo! I added some bacon and peanut butter to mine. Don’t be afraid! Pickles and peanut butter are amazing together! It says to cut the dough into 6 parts, since this is 3 servings there is a top and bottom that you pinch together correct? It doesn’t mention that specifically just to press 3/4 of edges? You are correct Kelsey! xo! Just out of curiosity, do you use the regular or culinary grade of Anthonys almond flour? Thanks! Hi Shannon! I’m not sure what you mean? I have only seen the finely ground and blanched I believe? xo! WOW! We had this for dinner last night, and it was absolutely incredible. Although now I see what you mean by stuffing it after closing it most of the way. I tried to put all the ingredients in before closing any of it and it got everywhere. Even still though, they turned out absolutely fantastic. And the burger sauce?! It took the burger from really good to out of this world phenomenal. I think I’m going to try a pizza pocket with these sometime soon… Maybe a taco pocket? I don’t know, I want to pocket everything now! These are amazing!!! Thanks for the recipe… I made them tonight and they came out perfect…yum!!! How many pockets does 1 recipe make? Love everything! So happy I found you! You make Keto much easier for me! Thank you! So excited to see your new stuff ! Same! The posts and recipes are just so great! NO F*(**&( WAY!! I have some of your tortilla dough in the fridge and leftover ground beef, these are happening TONIGHT! Made my day! OK SO THESE ARE AMAZING!!! The dough crisps up nicely on the outside, but puffs up and remains so bread-like inside. My bf and I couldn’t believe it lol! I’m going to point out that these do take a while to brown and then suddenly brown very quickly! I think we did 27 minutes.